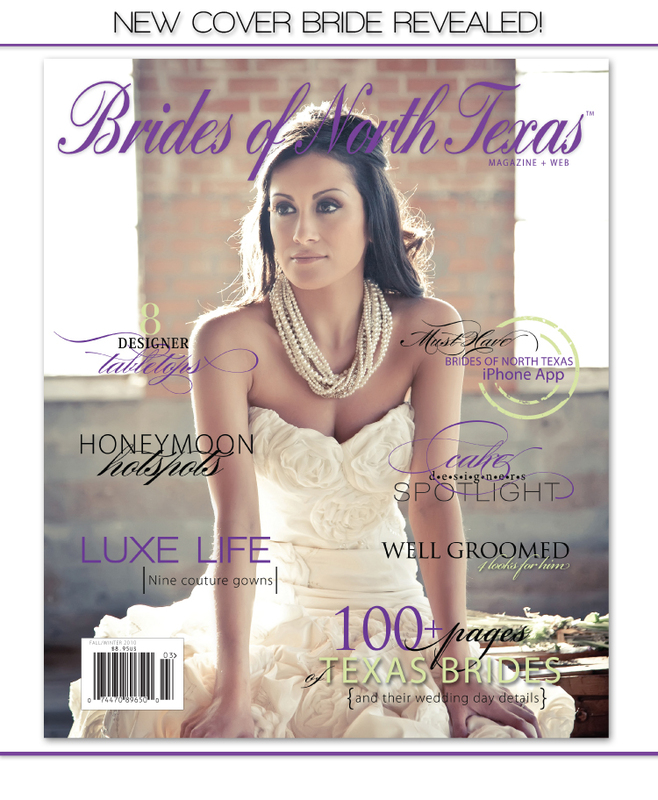 We’re absolutely thrilled to reveal the Brides of North Texas Fall/Winter 2010 Cover Bride! Choosing just one from so many beautiful brides and brilliant photographers was definitely a challenge! Congratulations to Leslie Spurlock Photography for this gorgeous portrait of new bride Ida Ramin! Her subdued elegance and beauty perfectly set the tone for an amazing new issue! Ida wore an ivory, strapless, taffeta “Rose Garden” gown with Chiffon roses by Elizabeth Fillmore, and a chunky pearl necklace that we adore! Ida Ramin and Bradley Gleaton were married in May at Stonebridge Ranch Country Club in McKinney! Check out more of their stunning wedding photos on pages A19 & A20 of the latest issue! Be sure to pick up a copy of the new Fall/Winter issue, available on newsstands next week. Brides of North Texas is available for purchase at Borders, Books A Million, Barnes & Noble, Walden Books and other fine North Texas retailers! Or you can pick up an advanced complimentary copy of the new issue at the Dallas Bridal Show this weekend! You’ll find endless inspiration and fantastic ideas for making your special day truly beautiful! Print out this coupon below to receive $1 off admission to the show! If you know any brides-to-be be sure to pass this along to them too! Be sure to stop by this Saturday and Sunday, July 31 and August 1, at the Dallas Market Center in Dallas from 10 am to 5 pm! 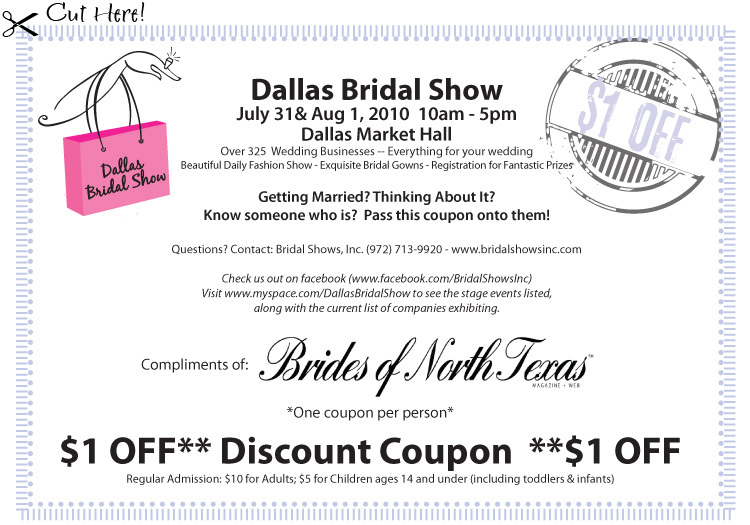 Don’t miss the chance to meet with talented local wedding vendors and make sure you stop by the Brides of North Texas booth be one of the first to pick up a complimentary copy of the ALL NEW Fall/Winter 2010 issue while you’re there! See you this weekend! « Previous Post: Brides of North Texas iPhone app is here!